Mr. Clarke typically deals with the probable. 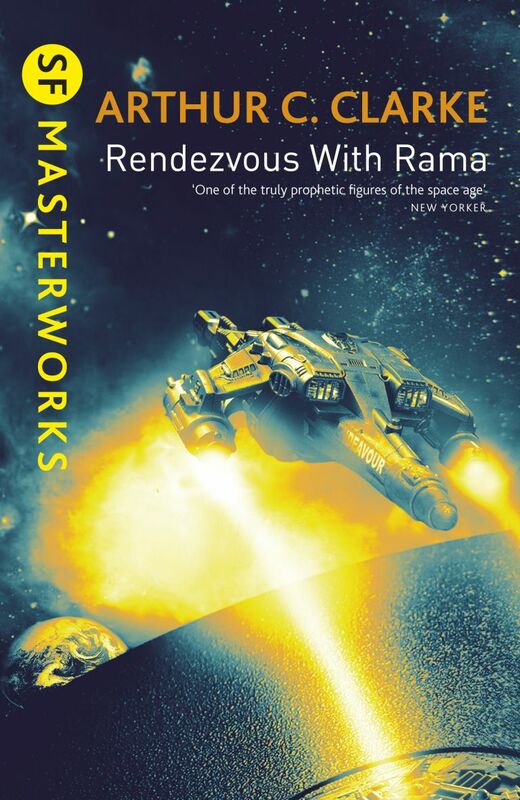 While his work is set into the far future, it’s always firmly grounded in the scientific knowledge of “today.” Rendezvous with Rama speculates about the arrival of a spacecraft sent to our solar system by a very distant and very advanced species. The spacecraft, called Rama by the scientists and astronauts sent to explore it, is the size of a large asteroid, big enough to contain a small world inside its great rotating mass. But once humanity finds away inside Rama, it becomes clear that no one is living inside the spacecraft/asteroid. What happened to them? Why was Rama sent to orbit our sun once and then head back into interstellar space? The characters in Mr. Clarke’s novel explore Rama as much as they can before it passes too close to the sun for humans to survive. This makes Rendezvous with Rama a travelogue, much like so many early and proto-science fiction novels of the late 19th and early 20th century were. While it’s very interesting reading, the way Mr. Clarke’s characters come and go made it difficult for me to immerse myself in the story the way I would have liked to. I’m not sure this is a fault with the book. It’s actually very realistic. A military expedition would use personnel as needed, send this squad to climb a mounting, this other man to pilot a boat across an ocean; it’s unlikely that one single person, or even a small group, would do all the work of a large mission. As for the ship itself, the ship really is the main character after all, I found it to be just about completely believable. Mr. Clarke sticks very close to what was considered scientifically possible in 1973, as far as I know–I was ten-years-old at the time. Most of what he predicts remains plausible today. I was actually very impressed by this. While he is very good with science, Mr. Clarke’s people remain a bit cold. Think of 2001: A Space Odyssey which was based on a screen play by Arthur C. Clarke who worked very closely with director Stanley Kubrick. While the visuals from the movie and its depiction of space travel, remain vivid and entirely believable, it’s very difficult to remember the characters. There was a guy called Dave, but it’s Hal the computer most of us recall. Tell me what Dave was like. I couldn’t tell you anything about him, but I can do a decent impersonation of Hal, good enough to creep out my younger brothers. Since I first read this book for my old blog, Ready When You Are, C.B., I’ve kept in on my TBR in Retirement shelf, along the rest of my small collection of Gollancz SF Masterworks editions. I’m a fan of their covers. I suppose there remains a good chance I’ll reread Rendezavous with Rama sometime. I like the travelogue aspect of fantasy/science fiction books like this one. They should constitute a sub-genre. Were I still in graduate school, I might even write a paper about them. Agree with you on this; the characters were not engaging.